Wow, in town 6 bedroom 3 bathroom home. Conveniently located near all. Master suite with jetted tub, fireplace, 7 head shower and awesome mountain views. Nice kitchen with open concept to informal dining area. Brick wood burning fireplace in living room, family room downstairs with gas stove. Covered porch overlooks large fenced backyard. Short sale, across the street from Farmin-Stidwell Elementary School play field. Private cabin in the woods, great shop 40×60, garage 20×20, private well and septic. Public land close by. Private spot on Huckleberry mountain to ride your horses. 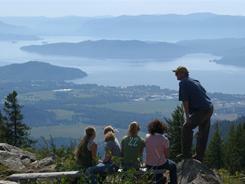 Easy access to Sandpoint and Coeur D’ Alene. Come live your country dream. level. Solid Pine doors and cabinets. Decks, Balcony and covered porch. Radiant Floor Heat. Priced to Sell. 2 homes on17.98 level acres. One home is a 4 bedroom/2 bath home. There is also a 1 bedroom/1 bath second house that has a separate driveway. Trees, great access, several outbuildings,(shop, pumphouse, 3 stall pole barn, tack room, 2 dog kennels and large storage area, and 2 smaller log sheds). Majestic views of the forests and Lake Pend Oreille near the Schweitzer Mountain Resort await visitors in Sandpoint, Idaho. Team that visited: Daniel and JoAnne Schaub (“The McNavigators”) of Cary, N.C.